Athletics Update: The Wildcat Nation had quite a week and weekend! Girls Tennis stars Mikayla Mannara and Katie Viau won sectionals and then competed all the way to the New York State quarterfinals; the Football team won a huge game against Liverpool and earned a chance to play in the sectional championship this Saturday at the Carrier Dome against Cicero-North Syracuse; and our Cheerleaders are Section 3 Champions for the second year in a row. How cool is that! 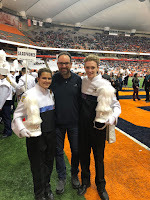 Marching Band Pride: Our Marching Band had a really interesting season. Since I have been here, you could track each band and their progress throughout the season in a pretty consistent way, and you could clearly see which bands were stronger than the others. 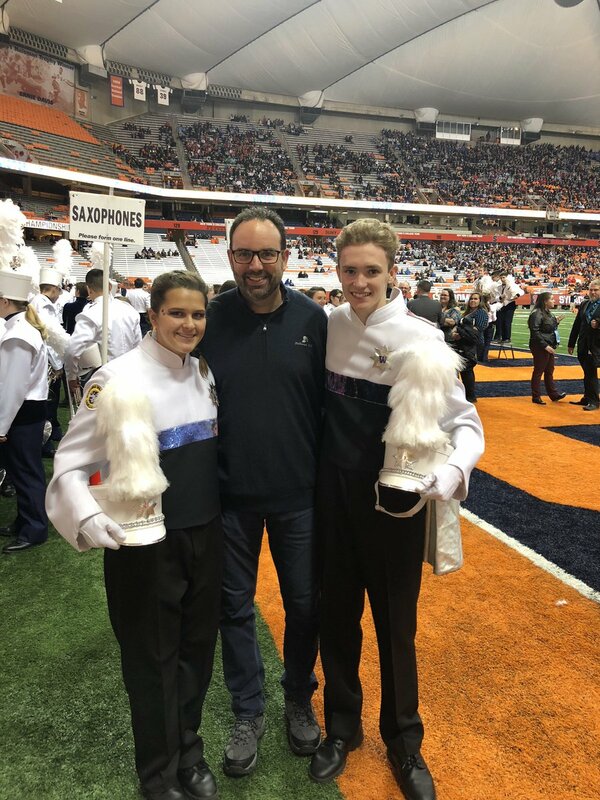 This year, several bands took first place in different competitions on their way to the Carrier Dome last night so it was really anyone's championship to win. Our Marching Band took fourth place, and I am proud of our students and commend the winners. For us, planning for next year has already begun! Conference and Safety: I had a couple of eye-opening moments at a conference last week. The conference was a national superintendent summit, invitation only, and there were a variety of topics for us to talk about. I helped to present the topic of communicating with staff, community, and students, as well as receiving feedback, and using that feedback. With the regularity of active shooter situations and mass shootings happening today, one of the other topics was school safety. I spoke to several different superintendents about how they are approaching school safety. Interestingly, approaches were all over the board. I spoke with some who were just hearing about the slogan "if you see something, say something" and to the superintendent of Newtown Public Schools (Sandy Hook Elementary) who has experience with every security product and protocol available. I also spoke to superintendents who arm teachers because the nearest law enforcement needs to be flown in by helicopter and is 40 minutes away; and to superintendents who will not support anyone armed in schools, including School Resource Officers. I am comfortable with where we are right now after taking it all in. We have the input from our forums, the guidance of the Onondaga County School Safety Task Force (I was a committee leader), excellent training for our staff, a great partnership with our local law enforcement, armed School Resource Officers, consistent drills for our students, an anonymous tip line, a way to take attendance in an emergency, and a capital project that will harden our entrances and upgrade our locks and cameras. Best practices in the area of safety are always changing, and we will stay on top of that. We had a great West Side Support Network Meeting last week and are beginning to plan some events related to substance use disorder and mental wellness in our community; so stay tuned for that. The major topics will be NARCAN training, mental health awareness, substance use disorder programming, support groups, and working with other organizations to support people in poverty in our area. 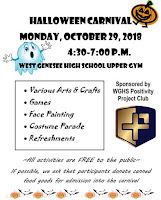 Halloween Carnival: Speaking of events, if you are looking for a really cool, safe place to take your kids for some Halloween fun, look no further than the West Genesee High School Halloween Carnival today from 4:00-7:00 p.m. in the upper gym of the high school. If you have attended before, you will notice it has gotten so big that they had to move it to a bigger space. There are all kinds of fun things to do for elementary students. The event is sponsored by the high school chapter of our Positivity Project, and admission is free; but bringing a canned good or non-perishable food item would be appreciated. We will keep some of the food on hand for our students who need it and donate the rest to our local food pantry. If you are there early, I will see you before I head to Buffalo for my first Monday Night Football Game. When this blog first started years ago, my intention was to get you up to speed about what happened over the past week, feature students and staff, let you know about what lies ahead, maybe fit in a larger example of something, and give you an understanding of my personality as your school leader. As the readership has grown to about 10,000 a week, I think we have kept to that model. I have also tried to keep these blogs to about a three-minute read, because I know that all of you are very busy. With all that in mind, buckle up because there is a lot of news you can use to report this week! On my end, I had a great time reading the "Big Pumpkin" to kindergarten students; teaching a class about strategic planning to adults. taking in Fiddler on the Roof (long but enjoyed it); and an SU Football overtime win (no, I am not going to weigh in on the quarterback controversy there, I have enough of my own things to take care of). Competition Updates: Wildcat Tennis stars Mikayla Mannara and Katie Viau advanced beyond the New York State regionals and much closer to a New York State Championship; Wildcat football advanced to the Section III Semifinals with a win over CBA; and the Marching Band took first place at their most recent competition held at Central Square, reminding the competition that they are still here and look forward to competing against them at the Carrier Dome in a couple of weeks. Our JV and varsity cheerleaders also took first place at the CNS Cheer Competition. Take a breath. Also last week, Our West Genesee High School PTSA held a "Car Care 101" program to teach students how to change a tire, know what to carry in their cars during the winter, and how to check and replace common car fluids. The "course" was taught by two of our employees, Gene Bobey and Sean Fahey, and Board of Education member Joe Simon. At the end of the evening they deployed an airbag in the parking lot that launched about 25 feet in the air, driving home the point that it is not a good idea to put your feet on the dashboard. It was so well received that they are going to have an encore performance in the spring! Update on Previous Blog Topics: Bringing you up to speed on two topics that I wrote about previously and that received a lot of feedback, we are making progress with the "skateboard project" and they are responding to your willingness to help for our students in poverty. The skateboard project, now titled "Deck the Halls" (get it?) has a poster (will share when it is totally final), a venue, and who will benefit from the production and auction of the boards. The decks have been produced and, as we speak, they are in the hands of our art and photography students to be designed. I don't want to post pictures of the final product until they are done, but they are COOL. Many of you responded to my last blog about how our community has changed, and you have offered to help with clothing and resources. Your response was actually overwhelming. We are working on a way to tap into your generosity and it may take the form of a pop-up clothing "shop" (everything would be free of course). There is a lot of work to get from idea to reality on this so stay tuned and THANK YOU. Being Neutral: The midterm elections are November 6, and the last couple of weeks before an election can be very negative. I have an obligation as superintendent to ensure that the District is not endorsing any candidate(s). If you see advertisements including me, our school, classrooms, fields, or students, please know that the District and I did NOT give permission for the use of any of those things. We have notified each of the area campaigns and candidates outlining our obligation to remain neutral. One of the reasons why I love my job is because I deal with different things every day, and this election cycle is certainly different. Lastly, in my career I have coached little league baseball, youth basketball, boys modified soccer, and junior varsity and varsity boys basketball. My time coaching little league and modified soccer remain some of my best memories, even though I was fortunate to have teams find success at the JV and varsity levels. At those younger ages, the players are learning how to work with and be a part of a team, how to win and lose, and I was able to establish relationships with kids that still exist today now that they have kids of their own. These two pictures really symbolize the joy of working with younger kids at the modified level. Thanks for reading, #GoWildcats, and enjoy the week! We had quite a Homecoming Week! Everywhere I turned I saw students full of pride for themselves, us as a school, and us as a part of something bigger. There is no way to collect data on the true feeling of positive morale unless you want to measure in decibels from the pep rally or the amount of blue and gold seen throughout the District all week. We are having fun, learning, and making our community the "place to be", as real estate agents continue to tell me. Congratulations to Emma Farmer and Matty McMahon who were crowned Homecoming Queen and King in front of a full house on Friday night. The football team and cheerleaders also enjoyed their senior nights as well as a win on the field. Football team will play the first round of sectionals this Friday at home against Christian Brothers Academy at 7:00 p.m. Boys Soccer team will play in sectionals on Thursday at Liverpool at 7:00 p.m. Girls Soccer team is the third seed and will play the second seed, Fayetteville Manlius (FM), in the semi-final; date and time to be announced. The Girls Swim, Girls Volleyball, Cross Country, and Cheerleading teams will compete in Sectionals, but the games start in another week or two. Once we know that information, we will share it with you! Just before the game, girls tennis players Mikayla Mannara and Katie Viau became Section III Class A Champions in a convincing win over a pair from FM. They will continue to the New York State Regional Competition tomorrow. Best of luck to them! Our Demographics: Community members often ask me the question, "how poor are we?". I have always been a believer that poverty does NOT and should NOT define a child or a school district. My expectation as a superintendent is that every child can succeed no matter their background, and the school community should always band together. Every child is an equal member of the Wildcat family. Our results show that our employees and students believe in this as well. Looking at the raw numbers though, some of you may be surprised at the number of families who are living in poverty in our community. 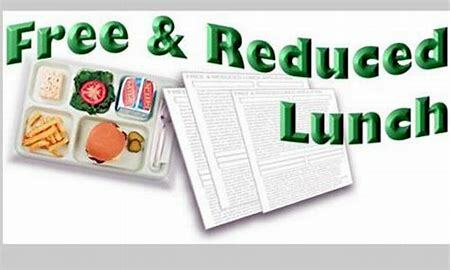 Federal guidelines for the 2018-2019 school year tell us that in order for a family to qualify for free and reduced lunch, a family of four must make $25,100 or less before taxes for free lunch and $25,100 to $46,435 for reduced lunch (https://www.federalregister.gov/documents/2018/05/08/2018-09679/child-nutrition-programs-income-eligibility-guidelines). As of today, just under 30% of our students qualify for free or reduced lunch. In raw numbers, that is almost 1,400 of our students in grades K-12. When I arrived in 2008, 8% of our families qualified for free or reduced lunch, which was approximately 440 students. Next, we need to consider students who are homeless. In 2008 when I arrived, we had no homeless students. As of today, 26 families in our District are homeless by definition. To be homeless by Federal definition, the child must lack fixed, regular, and adequate nighttime residence (https://nche.ed.gov/downloads/briefs/det_elig.pdf). We have structured our support and leadership styles so that you as community members, and students as a body, see our students as students; not affluent, poor, or homeless. Again, our results show that. One place where it is important to at least have an understanding of our families is when we do winter clothing or school supply drives. There IS a need, even though you might not see it. I had a meeting last week with several members of the faith community; multiple denominations. We spoke about how we can work together to help our families in poverty, families experiencing mental illness, and families experiencing substance use disorder. We also spoke about how we can support families that aren't experiencing any of those things, but are just trying to work through raising kids in the very fast paced society that we live in. We are creating some plans to help provide additional support for those who need it. 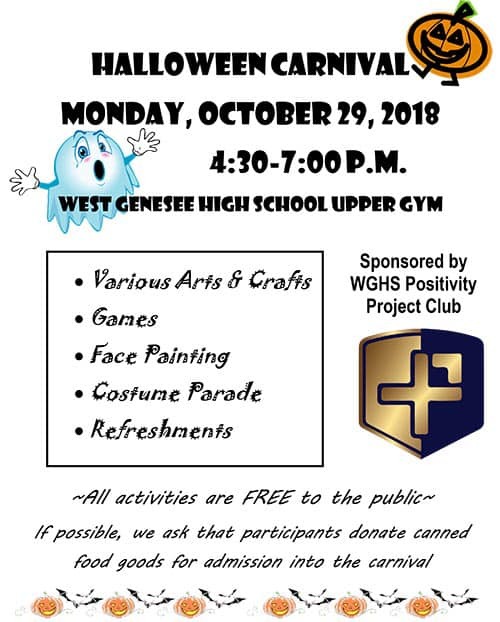 Our West Side Support Network (formerly known as the Community Coalition) will be having its first meeting on October 23 in the West Genesee High School Library at 2:45 p.m. All are certainly welcome. I will be rolling out our plans to meet the mental health needs of students and will also be giving an update on substance use disorder support in our area. Looks like summer is here for one last stand; and I'll take it! I hope you enjoyed the long weekend. I was able to get caught up on work and enjoy some time with my twin nephews. Leading into last weekend, and then over the weekend, we had some great things happen. 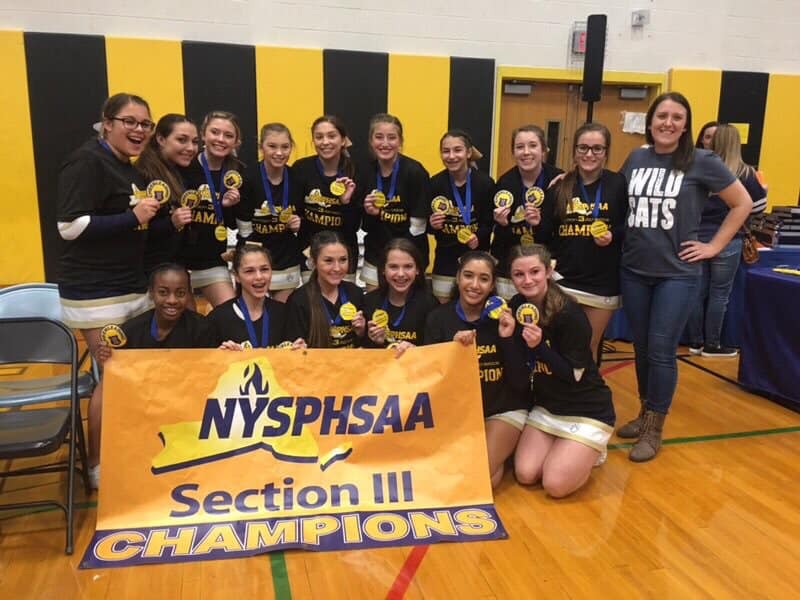 Competition Results: First, our Boys Golf team won the Section 3 title for the second time in as many years, and our Girls Tennis team won their first round of Sectionals. Cool! On Friday night the Boys Football team went to Fayetteville Manlius on their homecoming night. They won a very hard fought battle to gain them a home game in the playoffs. The probability is high that their main rival CNS will be on the opposite side of the bracket, setting up a potential rematch. While all that was going on, our Marching Band took their show on the road to Virginia Beach to compete in the Tidewater Regional. They were all smiles as they returned to school. 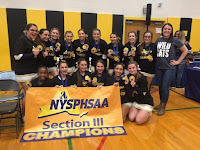 They came in first in their division and had the highest score overall of 86.75 as they inch closer to the Carrier Dome show at the end of the month. Congratulations to them! Homecoming Week is Here: Homecoming is this Friday and all of you are invited to join us at the high school for a Homecoming Carnival from 3:00-6:00 p.m. and prior to the football game versus Rome Free Academy. They will have all kinds of games, bounce houses, face painting, and will be celebrating as we show off our Wildcat pride! Students are also celebrating their pride throughout the week with themes for each day leading up to our annual pep rally. Check out their decorations! We are very fortunate to have such respectful students because they will all still look exactly like this headed into the upcoming weekend! Have a great week and hope to see you at the game Friday night! What a weekend! I really like it when our facilities are used as much as possible because it shows how much care our buildings and grounds crew and custodians put into what they do. It also solidifies the District's spot as the center of the community. This weekend did not disappoint! On Friday the high school was alive with football, fans, Friday Night Lights, the Marching Band, and the Wildcat Nation. Loud would be an understatement! The boys played a great game against a very tough CNS football team and came up just short. The Marching Band captivated the crowd at halftime with a great performance, and the Wildcat Nation was in full force. Just a fantastic night all around. Tournament of Bands and Technology: The Marching Band (and their parents and staff) got right back to work on Saturday morning to host the Tournament of Bands. They played host to nine other high-quality Marching Bands and also put on quite an exhibition themselves! What made the evening even cooler were the awards that were handed out by Executive Principal Shannon Coholan and West Genesee graduate and United States Rear Admiral John Okon. The awards were truly one of a kind. They were manufactured by students in our technology club under the direction of teacher Matt Makowiec; and I want one of them! Congratulations to all on a very successful Tournament of Bands. Sometimes during my building visits, I come across multi-disciplinary projects that are just so cool that they need to be recognized. Steve Ficarra, a technology teacher at our high school, has students working on a mass production project as part of the Design and Manufacturing class. They are mass producing (about 40) skateboard decks. I received a prototype and these decks are as nice as, or better, than what you would buy in a store. But wait, there's more. The decks are going to be decorated by students in art and photography classes. We have a TON of art and photo talent so I can only imagine what these are going to look like when they are done. Next, the board decks are going to be entered into an art competition in downtown Syracuse at the Gear Factory. Lastly, they are going to try to get donations for the "trucks and wheels" so they become full functioning skateboards. They will then be auctioned and donated to needy children in our area leading up to the holidays. This project certainly makes me proud to be a Wildcat, and I am sure Tony Hawk would be proud also! I will post pictures of these pieces of art as they move through the development process. Student Academic Achievements: Congratulations goes out to our National Merit Scholar Semi-Finalist, Philip Martin, and to National Merit Commended Scholars: Luke Mullane, Rose Hays, Kayla Hoovler, and Benjamin Davis. 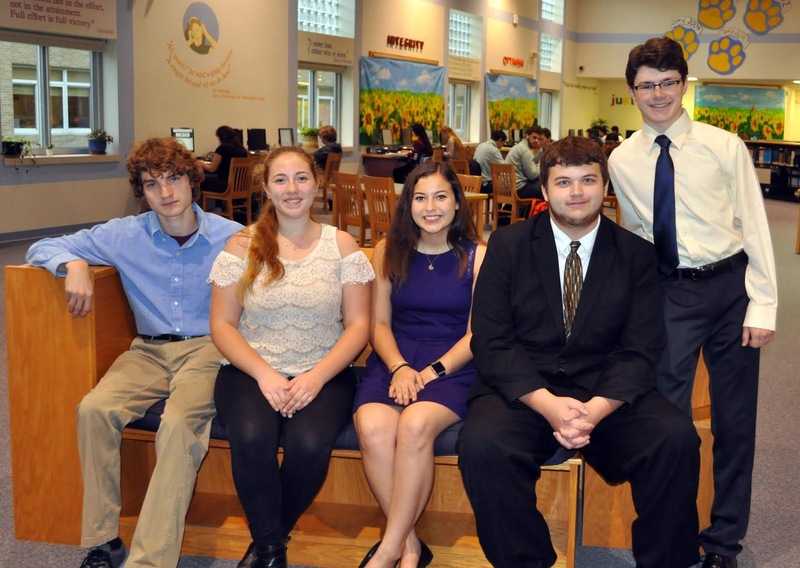 These students are among 50,000 of more than 1.6 million students who entered the Merit Program by earning high scores on the Preliminary Scholastic Assessment Test (PSAT) taken in October of their junior year. Click here to read the full article. A Bucket List Item: If that wasn't enough, my older son and I got a chance to check off a bucket list item and get to Lambeau Field to watch the Buffalo Bills take on the Green Bay Packers. Now an adult, he and I had been planning this since he was in middle school. I am a Bills fan until they are out for the season and then a Packers fan the rest of the way so I couldn't lose. Although the Bills didn't come out on top, it was still a great experience and one I recommend if you are a football fan. We also made some good memories.